The first snow of the season is falling today so it’s time to break out my favorite soup recipe. I found this basic recipe a while back in Good Housekeeping as part of a seven day all-you-can-eat soup diet. Since then I’ve jazzed it up with the addition of herbs and garlic, experimented with substituting different veggies and incorporated carbs and proteins in various versions. One of the soup’s pluses is no matter what you throw in, It’s impossible to botch the results (at least I haven’t yet — thank you Soup Gods). If you like your vegetable soup on the light side and are super serious about losing some weight, you can stick with the original recipe. At 45 calories per cup, it’s meant to be a dinner meal (with added protein) that compliments the dietary-planned breakfast and lunches. These portion controlled meals contain tasty sounding items like ham and cheese sandwiches, tangerine and avocado salad, California turkey pita with bacon, red beans and rice stew and strawberry, orange smoothies. In between meals, you can chow down on as much of the low calorie soup as your culinary heart desires. Making at least 25 cups, the soup requires a monster 12-quart stockpot. The beauty part is you can freeze most of it and enjoy it for numerous meals afterward with no more effort than flicking on a heat switch. I always up the garlic (making my Italian grandmother proud) and toss in 4 cloves instead of the required one. I also up the herbs — a LOT. Depending on which of my own versions I’m making, I usually add thyme, cumin and Italian seasoning. In the greens department, I’ve substituted cabbage with gutsy collard greens or escarole. I’m not big on using frozen veggies. Fresh ones in the soup freeze better. Since I often enjoy this soup more for its hearty rich flavor, than its dietary appeal, I sometimes add a 1/2-cup of rice. This thickens the soup and can require additional liquid. Or to get a protein kick and some smoky flavor, I’ll toss in canned black or pink beans. When I don’t have parsnips on hand, (which is pretty much all the time) and the soup seems a bit on the thin side, I’ll flip in a can of corn or peas. The one constant is a thick grating of cheese that always tops the final dish. Experimentation is the name of the game here, starting out with low measures of herbs and other ingredients and increasing them till the right notes of taste and texture are struck. 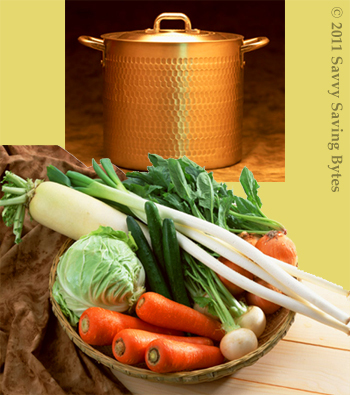 So get out that stockpot, dive into this soup and save yourself lots of dimes, time and effort. Sounds like a soup recipe that would work well in our household :). Actually we live on veggie soups of one kind or another, though I finally did fall off the vegan bandwagon, have added back in 1 egg per day, some yogurt, and a little roasted chicken to my veggie soup portion so I can avoid carbs like rice. It seems to be working. After one week I’ve lost a little, which is good, because I’d put a little back on :(. The never ending battle! The nice thing about rice carbs in this soup is that the percent of rice is so small in comparison to all the other ingredients that I don’t think the calorie count is probably too high. Course I just might be telling myself that because I really love the rice in it. Another soup I want to try is something called Rag Soup where raw eggs are stirred into chicken soup. Raw eggs in anything give me the willies, but I suppose if you drop them into hot soup they’ll cook quickly. This time I remembered to turn on notify. The eggs turn into noodles – hence “rag” soup.